South Florida Motorcycle Accident Attorney | Law Office of Andrew G. Rosenberg, P.A. There’s much to appreciate about riding a motorcycle in South Florida. It's fun—especially in our climate. Bikes typically get better gas mileage and are easier to park than other vehicles, too. As a motorcyclist, you share the rules of the road with other motorists who must use reasonable care to avoid accidents with you. Unfortunately, this doesn’t always happen. Sometimes other drivers are negligent, and you're the one who suffers significant injuries. Distracted driving. In 2017, the state of Florida reported that more than 50,000 accidents for the year were caused by distracted driving. This includes smartphone use, eating, drinking, and grooming. Driving while under the influence. While operating a vehicle under the influence of alcohol is still an issue, drugged drivers—whether using illicit or prescription drugs—are an increasing problem in South Florida. Slowed reactions times and loss of control put motorcyclists at risk. Head-on collisions. In 2016, statistics from the National Highway Traffic Safety Administration (NHTSA) reported that more than 70 percent of fatal motorcycle crashes are due to a rider being struck from the front by another vehicle. Left-hand turns. Motor vehicle operators making left turns often don't see a motorcycle rider before it's too late. More than 40 percent of car-motorcycle collisions are because of left turns. Road hazards. Riders have much more difficulty navigating potholes, debris, uneven lanes, and other surface issues. Often, a municipality may be found at fault for not properly maintaining roadways. A full investigation will determine whether one or more of these factors—or another form of negligence—caused the accident and resulting injuries. Road rash. When you skid across the road, your skin may be significantly torn and damaged. This is known as road rash. It can be painful, cause extreme scarring, and leave you vulnerable to infection. Broken bones. Any bone can break when you fall from your bike or collide with something else. Some breaks may be complicated and require multiple surgeries. Facial and dental injuries. If your face hits the ground then you may break a facial bone, suffer dental injuries, or experience an eye injury. Rider’s arm. Rider’s arm, also known as biker’s arm, occurs when the motorcycle falls on your arm during a collision. The nerves in your upper arm may be significantly damaged. Amputations. Sometimes the injuries from a motorcycle wreck are so severe a limb is amputated at the scene of the crash or later in the hospital. Traumatic brain injury. 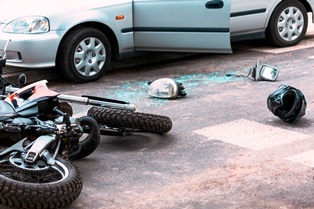 If you hit your head in a motorcycle crash, you may suffer a concussion or traumatic brain injury. The immediate circumstances of the impact and the long-term effects of it depend both on how hard you hit your head and what part of the brain was damaged. Spinal cord injury. This complication may you paralyzed below the point on the spine that was hurt. In some cases, you may suffer a lack of sensation rather than full paralysis. In addition, as of 2017, Florida ranked first in the nation for the number of motorcyclist deaths. NHTSA data indicates our state had more than 550 biker fatalities. In the U.S., there were more than 5,000 rider causalities. Medical expenses. Any healthcare cost including but not limited to ambulance rides, hospitalizations, surgeries, medications, doctors’ visits, physical therapy, occupational therapy, and other treatments may be included in your recovery. Lost income. Whether you have to reduce hours at your job or you can’t work at all, a proper settlement may account for any wages, benefits, or income from self-employment. Out-of-pocket costs. This includes damage to your bike and any other expenses, such as transportation costs, directly related to your injuries. Physical pain and emotional suffering. The pain and suffering you experience may be hard to quantify but these damages may be quite significant to your case. In general, an insurance company will be unwilling to provide you with a fair settlement unless you have the necessary evidence to prove who was liable for the accident and the value of your injuries. This makes partnering with a skilled motorcycle accident attorney all the more necessary. You have a limited amount of time to take action to protect your rights after a motorcycle wreck. The Florida statute of limitations generally gives you four years to file a claim. However, don't wait that long to take action. Instead, contact the Law Office of Andrew G. Rosenberg, P.A. as soon as possible to protect your rights. Attorney Andrew G. Rosenberg will treat you as a member of his family. He'll investigate what happened, advise you on legal options, negotiate with insurance on your behalf, and take a strong stance to support your full recovery of damages. Make the first step toward your legal recovery today by contacting us for a free and confidential consultation. You can reach us by phone or the contact form on this page.